Married Name circa 1881 As of circa 1881,her married name was Sheehan. Mary Jane Kane was born in September 1859 at Wisconsin. She was the daughter of Henry Kane and Mary McCollon. Mary Jane Kane married James M. Sheehan circa 1881. In February 1920 Mary Sheehan, son John and sister Margaret Kaney visiting her brother Henry Kane. [S248] U.S. Federal Census 1860 U.S. Federal Census, by Ancestry.com, Pg 222. Dwelling 1594. [S247] U.S. Federal Census 1870 U.S. Federal Census, by Ancestry.com, Stamp 37. Page 19. Dwelling 122. [S246] U.S. Federal Census 1880 U.S. Federal Census, by Ancestry.com, ED149. Dwelling 70. 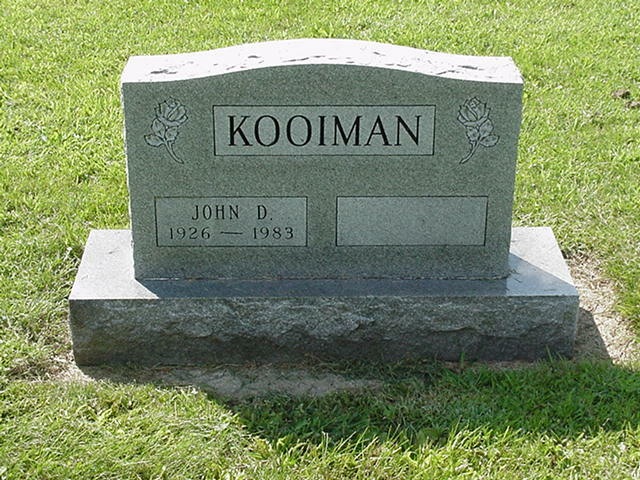 John D. Kooiman was born on 29 July 1926 at South Dakota. 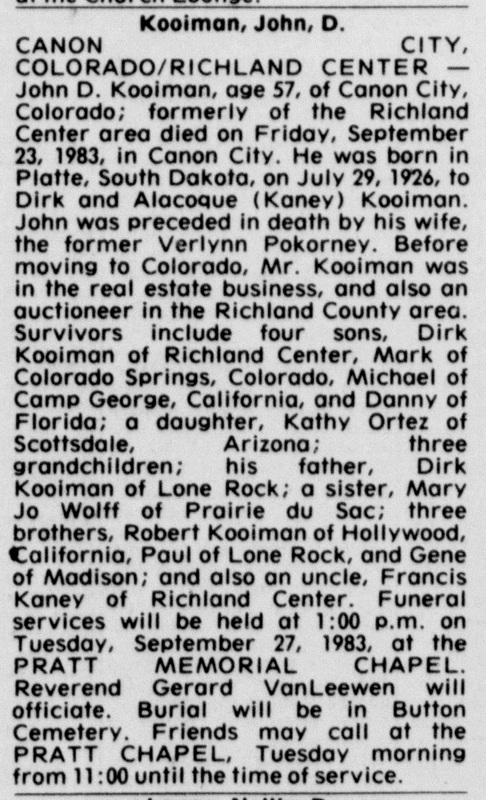 He was the son of Dirk Kooiman and Mary Aloque Kaney. 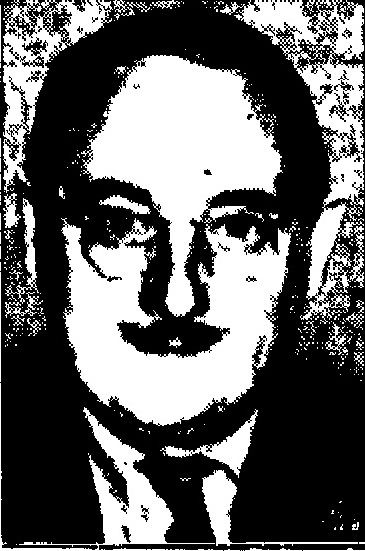 John D. Kooiman married Verlynn I. Pokorney, daughter of Ed Pokorney and Curl Loween McGirr, in 1947. 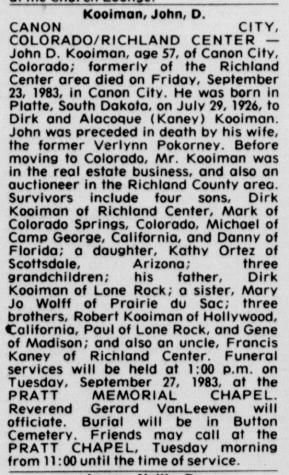 John D. Kooiman died on 23 September 1983 at age 57 John D Kooiman obituary. John D. Kooiman obtained US Social Security Card at Wisconsin; last residence Canon City, Fremont, Colorado. He was living in 1964 at Richland Center, Richland, Wisconsin. [S250] U.S. Federal Census 1930 U.S. Federal Census, by Ancestry.com, ED2-15. Dwelling 138. [S373] U.S. Federal Census 1940 U.S. Federal Census, by Ancestry.com, Year: 1940; Census Place: Willow, Richland, Wisconsin; Roll: T627_4518; Page: 5B; Enumeration District: 52-23. Married Name 1947 As of 1947,her married name was Kooiman. 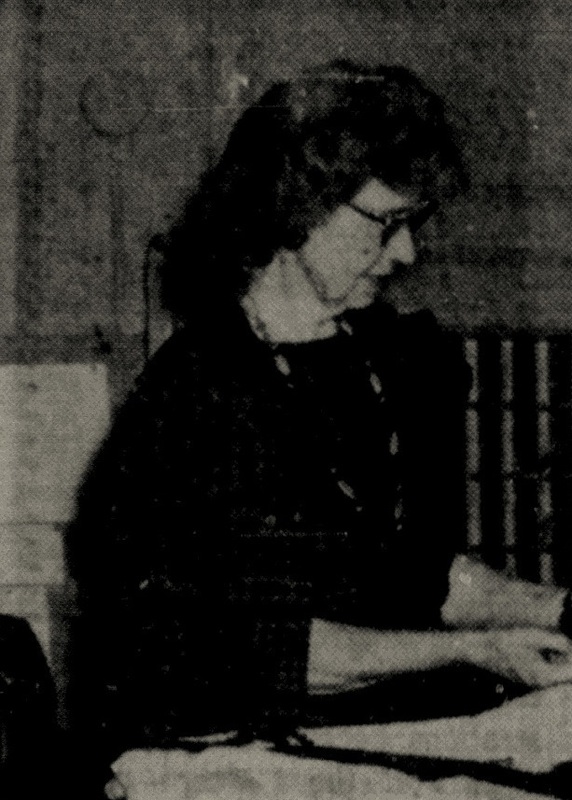 Verlynn I. Pokorney was born on 13 January 1926 at Wisconsin. She was the daughter of Ed Pokorney and Curl Loween McGirr. Verlynn I. Pokorney married John D. Kooiman, son of Dirk Kooiman and Mary Aloque Kaney, in 1947. [S190] The Richland Observer, 25b-158. [S250] U.S. Federal Census 1930 U.S. Federal Census, by Ancestry.com, Ward 3. ED52-17. Dwelling 181. Name Variation Antonie Kooiman was also known as Anthony. Name Variation Antonie Kooiman was also known as Antony. Name Variation Antonie Kooiman was also known as Kooijman. Antonie Kooiman was born on 11 January 1849 at Oud Beijerland, Zuid-Holland, Netherlands. He married Woutrena Hoek circa 1878. Antonie Kooiman died on 5 May 1913 at Douglas, South Dakota, at age 64. 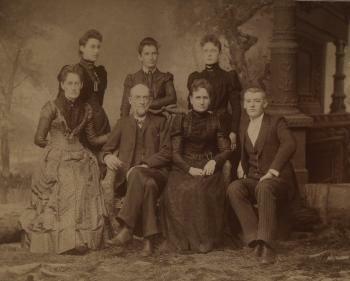 Antonie Kooiman and Woutrena Hoek immigrated in 1883. [S245] U.S. Federal Census 1900 U.S. Federal Census, by Ancestry.com, ED138. Dwelling 133. [S244] U.S. Federal Census 1910 U.S. Federal Census, by Ancestry.com, ED171. Dwelling 33. [S9] South Dakota, South Dakota Birth Records South Dakota, State File Number: 608629 (unknown file date). [S9] South Dakota, South Dakota Birth Records South Dakota, State File Number: 608626 (unknown file date). [S9] South Dakota, South Dakota Birth Records South Dakota, State File Number: 771978 (unknown file date). [S9] South Dakota, South Dakota Birth Records South Dakota, State File Number: 483372 (unknown file date). [S9] South Dakota, South Dakota Birth Records South Dakota, State File Number: 595076 (unknown file date). [S9] South Dakota, South Dakota Birth Records South Dakota, State File Number: 572176 (unknown file date). Name Variation Woutrena Hoek was also known as Woutrina. Married Name circa 1878 As of circa 1878,her married name was Kooiman. Woutrena Hoek was born on 24 August 1856 at Oud Beijerland, Zuid-Holland, Netherlands. She married Antonie Kooiman circa 1878. Woutrena Hoek died on 13 February 1930 at New Holland, Douglas, South Dakota, at age 73. Woutrena Hoek and Antonie Kooiman immigrated in 1883. Woutrena Hoek had 12 with 11 living in 1900 children. [S243] U.S. Federal Census 1920 U.S. Federal Census, by Ancestry.com, ED82. Dwelling 118. Edward Doyle married Catherine (?). Edward Doyle was born circa 1823 at Ireland also reported as about 1830. He died on 14 April 1882 52y; children adopted by Michael Quinn. [S247] U.S. Federal Census 1870 U.S. Federal Census, by Ancestry.com, Page 2. Dwelling 15. [S246] U.S. Federal Census 1880 U.S. Federal Census, by Ancestry.com, ED264. Page 10. Dwelling 88. Edward Doyle was born in February 1881 at Wisconsin. He was the son of Edward Doyle and Catherine (?). 1895 Washington, Sauk, Wisconsin Edward Doyle is counted on the census of 1895 in the household of Michael Quinn at Washington, Sauk, Wisconsin; 3 males and 2 females; all born in the US. 1 June 1905 Washington, Sauk, Wisconsin Edward Doyle is lisetd as nephew on the census of 1 June 1905 in the household of Michael Quinn at Washington, Sauk, Wisconsin. [S245] U.S. Federal Census 1900 U.S. Federal Census, by Ancestry.com, ED148. Dwelling 15. [S244] U.S. Federal Census 1910 U.S. Federal Census, by Ancestry.com, ED129. Sheet 11A. Dwelling 216. 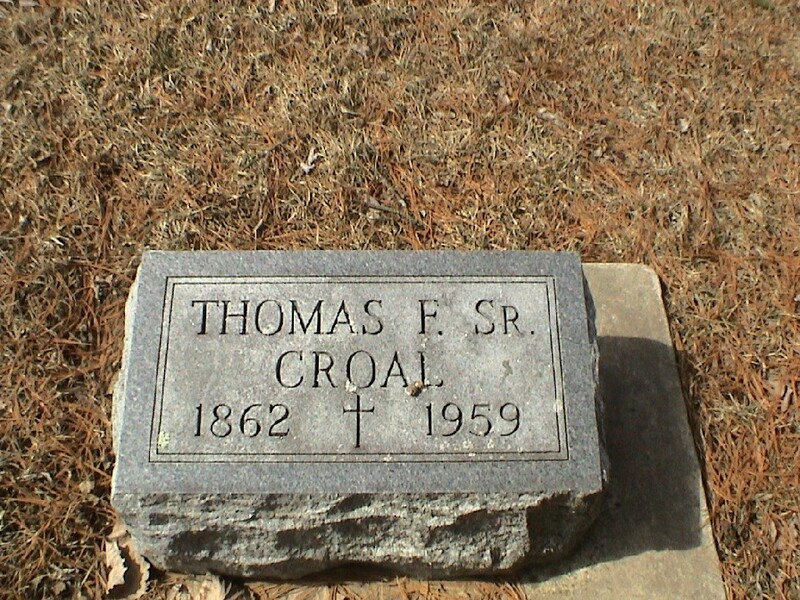 Thomas Francis Croal Sr. was born in June 1862 at Wisconsin tombstone lists birth year as June 1861. He was the son of John Croal and Catherine Daly. 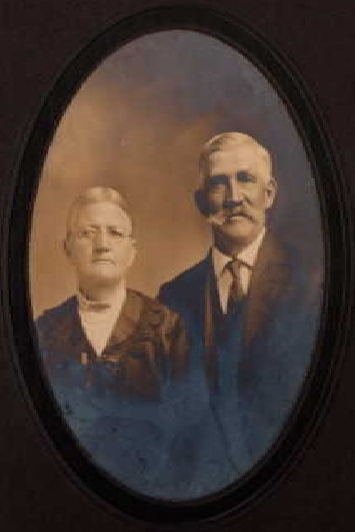 Thomas Francis Croal Sr. married Julia Agnes Dempsey circa 1892. Thomas Francis Croal Sr. died on 16 August 1959 at in hospital, Milwaukee, Wisconsin, at age 97 Thomas Francis Croal obituary. He was buried after 16 August 1959 at Our Lady of the Fields, Loreto, Sauk, Wisconsin. Thomas Francis Croal Sr. was a stone mason in 1900. Before June 1905 Thomas Croal's wife died, leaving him with five small children to raise. So his sister, Katherine, one of the two sisters who were still living with brother Michael, went to Kansas City to get the children and brought them back to the farm to live. He was a railroad flagman in 1920. 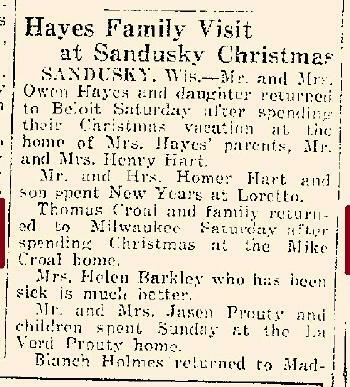 In January 1923 at Sandusky, Sauk, Wisconsin, Thomas Croal and family returned to Milwaukee Saturday after spending Christmas at the Mike Croal home. [S245] U.S. Federal Census 1900 U.S. Federal Census, by Ancestry.com, ED63. Dwelling 233. [S244] U.S. Federal Census 1910 U.S. Federal Census, by Ancestry.com, ED129. Stamp 59. Sheet 11A. Dwelling 209. [S243] U.S. Federal Census 1920 U.S. Federal Census, by Ancestry.com, ED172. Sheet 12B. Dwelling 202. Name Variation Fredonia Agnes Croal was also known as Donnie. Married Name before 1940 As of before 1940,her married name was Kinnee. Fredonia Agnes Croal was born on 15 April 1894 at Aberdeen, South Dakota. She was the daughter of Thomas Francis Croal Sr. and Julia Agnes Dempsey. As of 1930, Fredonia Agnes Croal was never married. She married Orin Robert Kinnee, son of James D. Kinnee and Caroline Faucett, before 1940. Fredonia Agnes Croal died on 29 December 1980 at Milwaukee, Wisconsin, at age 86 also reported as 31 Dec 1980. Fredonia Agnes Croal obtained US Social Security Card at Wisconsin; last benefit Cadott, Chippewa, Wisconsin. 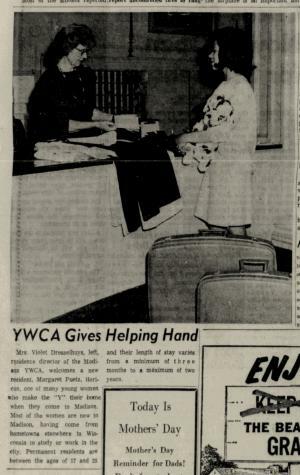 In August 1926 Fredonia Croal, Milwaukee, came to spend a month at the John Croal home and with her aunt, Mary Croal, Sandusky. She was a public school teacher in 1930. [S230] Milwaukee Catholic Cemeteries Cemetery records, by Milwaukee, Block: 6 Section D Row: 256. [S364] Wisconsin State Census Wisconsin State Censuses, 1895 and 1905, by Ancestry.com, Dwelling 74. [S250] U.S. Federal Census 1930 U.S. Federal Census, by Ancestry.com, ED40-363. Dwelling 365. [S373] U.S. Federal Census 1940 U.S. Federal Census, by Ancestry.com, Year: 1940; Census Place: Milwaukee, Milwaukee, Wisconsin; Roll: T627_4559; Page: 11B; Enumeration District: 72-443. Name Variation Evangeline V. Croal was also known as Van. Married Name circa 1928 As of circa 1928,her married name was Milton. Evangeline V. Croal was born on 29 July 1896 at South Dakota also reported as Aug 1896. Evangeline V. Croal married John Anthony Milton circa 1928. Evangeline V. Croal died on 6 January 1990 at age 93. Evangeline V. Croal obtained US Social Security Card at Wisconsin; last residence not specified. She was a public school teacher in 1920. 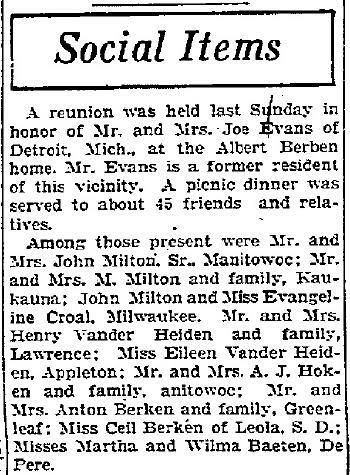 In July 1927 at Wisconsin Mr and Mrs Joe Evans reunion - including John Milton and Evangeline Croal. [S250] U.S. Federal Census 1930 U.S. Federal Census, by Ancestry.com, ED222. Dwelling 16. Name Variation Violet Mary Croal was also known as Mary Violet. Married Name 1926 As of 1926,her married name was Dresselhuys. Violet Mary Croal was born on 12 June 1898 at Kansas City, Missouri, also reported as Jan 1899. Violet Mary Croal married Clarence Dresselhuys in 1926. 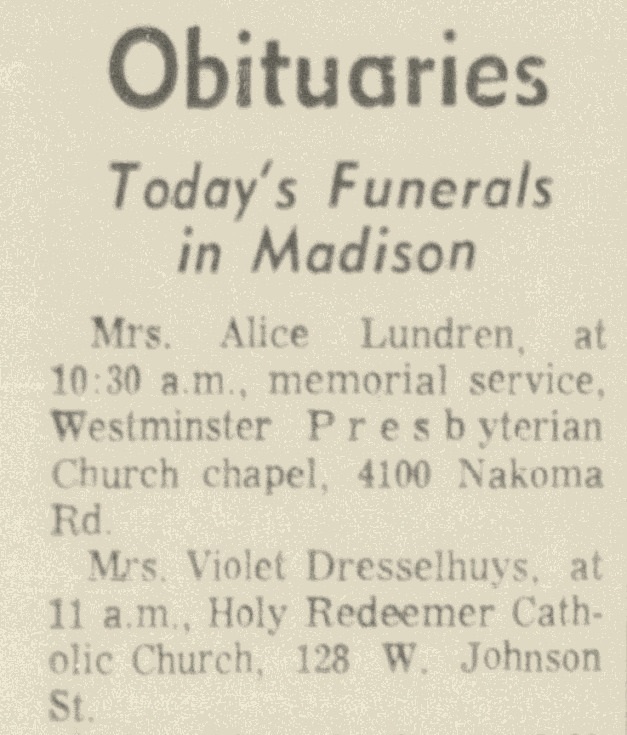 Violet Mary Croal died on 24 March 1967 at age 68 Violet (Croal) Dresselhuys obituary. 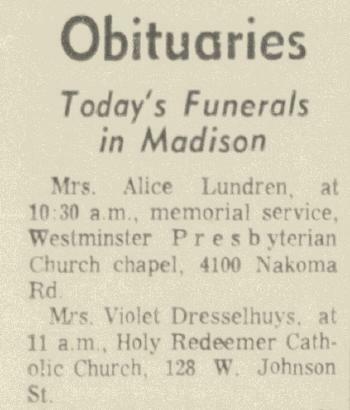 She was buried on 27 March 1967 at Madison, Dane, Wisconsin, Violet (Croal) Dresselhuys funeral notice. Violet Mary Croal obtained US Social Security Card at Wisconsin; last residence Madison, Dane, Wisconsin. 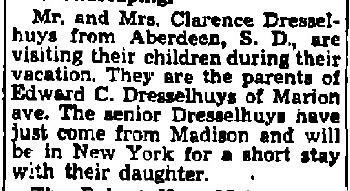 In August 1951 Clarence and Violet (Croal) Dresselhuys visiting children in Madison to Chicago to New York. 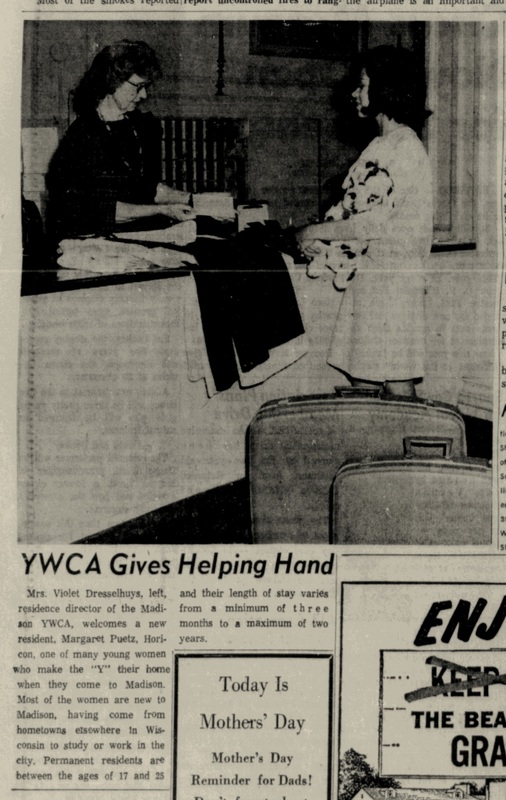 In May 1966 at Madison, Dane, Wisconsin, Violet (Croal) Dresselhuys, Residence Director of the Madison YMCA. [S250] U.S. Federal Census 1930 U.S. Federal Census, by Ancestry.com, Year: 1930; Census Place: Aberdeen, Brown, South Dakota; Roll: 2218; Page: 3A; Enumeration District: 0006; Image: 723.0; FHL microfilm: 2341952. [S373] U.S. Federal Census 1940 U.S. Federal Census, by Ancestry.com, Year: 1940; Census Place: Aberdeen, Brown, South Dakota; Roll: m-t0627-03849; Page: 1A; Enumeration District: 7-6. Thomas Francis Croal Jr. was born on 28 September 1901 at Missouri. He was the son of Thomas Francis Croal Sr. and Julia Agnes Dempsey. Thomas Francis Croal Jr. married Olive M. Maas, daughter of George Albert Maas and Mary Ann (? ), circa 1924. Thomas Francis Croal Jr. died on 22 November 1980 at Sauk, Wisconsin, at age 79. He was buried after 22 November 1980 at Our Lady of the Fields, Sauk, Wisconsin. Thomas Francis Croal Jr. obtained US Social Security Card at Michigan; Last residence is Reedsburg, Sauk, Wisconsin. [S250] U.S. Federal Census 1930 U.S. Federal Census, by Ancestry.com, ED40-370. Dwelling 109-143. [S373] U.S. Federal Census 1940 U.S. Federal Census, by Ancestry.com, Year: 1940; Census Place: Washington, Sauk, Wisconsin; Roll: T627_4523; Page: 8B; Enumeration District: 56-40. 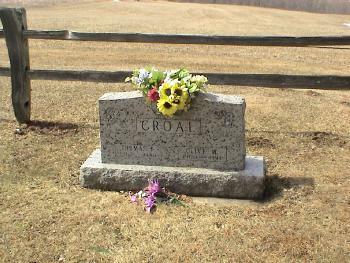 Andrew J. Croal was born on 28 April 1903 at Missouri. Andrew J. Croal married Marion (?) circa 1930. Andrew J. Croal witnessed the death of Mary A. Croal in April 1945 at Milwaukee, Wisconsin; Mary A Croal, 80, obituary. Andrew J. Croal died on 10 March 1994 at age 90. Andrew J. Croal obtained US Social Security Card at Wisconsin; Last residence Milwaukee, Wisconsin..
[S230] Milwaukee Catholic Cemeteries Cemetery records, by Milwaukee, Block 6 Section D Row 256. [S250] U.S. Federal Census 1930 U.S. Federal Census, by Ancestry.com, ED40-189. Dwelling 22. Name Variation Anna Nancy Hafner was also known as Hoffner. Name Variation Anna Nancy Hafner was also known as Anne. Name Variation Anna Nancy Hafner was also known as Haffner. Married Name 15 July 1857 As of 15 July 1857,her married name was Prunty. Anna Nancy Hafner was born in December 1834 at Tipperary, Ireland. She was the daughter of John Hafner and Nora Dwyer. Anna Nancy Hafner married Patrick Henry Prunty, son of Felix Laughlin Prunty and Abagail Kallahan, on 15 July 1857 at Outagamie, Wisconsin. Anna Nancy Hafner died in 1909 in the winter. Anna Nancy Hafner immigrated with John Hafner and Nora Dwyer in 1837. John Hafner witnessed the migration in 1848 at Outagamie, Wisconsin. Anna Nancy Hafner had 10 with 9 living in 1900 children. [S248] U.S. Federal Census 1860 U.S. Federal Census, by Ancestry.com, Page: 436. Dwelling 1286. [S247] U.S. Federal Census 1870 U.S. Federal Census, by Ancestry.com, Page 28. Dwelling 213. [S246] U.S. Federal Census 1880 U.S. Federal Census, by Ancestry.com, ED123. Dwelling 123. NA Film Number T9-1440. Sheet 184D. [S245] U.S. Federal Census 1900 U.S. Federal Census, by Ancestry.com, ED82. Stamp 25A. Dwelling 88. Henry Dorow was born in June 1871 at Wisconsin also reported as Jun 1861. He was the son of Godfried Dorow and Wilhelamina Braun. Henry Dorow married Lottie A. Merriman, daughter of Edward Sylvanus Merriman and Ursula A. Noyes, circa 1893. Henry Dorow died in 1913. [S246] U.S. Federal Census 1880 U.S. Federal Census, by Ancestry.com, NA Film Number T9-1446. Page 281A. ED265. Dwelling 116. [S245] U.S. Federal Census 1900 U.S. Federal Census, by Ancestry.com, ED149. Dwelling 114. [S364] Wisconsin State Census Wisconsin State Censuses, 1895 and 1905, by Ancestry.com, Dwelling 206. [S244] U.S. Federal Census 1910 U.S. Federal Census, by Ancestry.com, ED113. Sheet 6B. Dwelling 135. Name Variation Lottie A. Merriman was also known as Mirman. Married Name circa 1893 As of circa 1893,her married name was Dorow. Married Name before 1920 As of before 1920,her married name was Vogel. Lottie A. Merriman was born on 17 April 1870 at Wisconsin. She was the daughter of Edward Sylvanus Merriman and Ursula A. Noyes. Lottie A. Merriman married Henry Dorow, son of Godfried Dorow and Wilhelamina Braun, circa 1893. Lottie A. Merriman married Frank A. Vogel, son of Andrew Vogel and Mary Weller, before 1920. Lottie A. Merriman died on 27 July 1950 at age 80. [S214] Wisconsin Sauk Co Cemetery Records Vol 9, page 76. [S247] U.S. Federal Census 1870 U.S. Federal Census, by Ancestry.com, Page 8. Dwelling 56. [S246] U.S. Federal Census 1880 U.S. Federal Census, by Ancestry.com, NA Film Number T9-1446 Sheet 221B. [S243] U.S. Federal Census 1920 U.S. Federal Census, by Ancestry.com, ED152. Dwelling 205. Married Name Her married name was Mercer. Mary (?) married Chauncey Delos Mercer, son of Joseph Benjamin Mercer and Emily Delores Gallop, circa 1920. Married Name 22 March 1923 As of 22 March 1923,her married name was Frahm. Erna Matilde Batterman was born on 26 July 1901 at Crete, Will, Illinois. She was the daughter of Heinrich Friedrich Christoph Batterman and Wilhelmina Maria Riechers. Erna Matilde Batterman was baptized on 25 August 1901 at Zion UCC, Dyer, Lake, Indiana. She married Albert Frahm, son of Jacob Frahm Jr. and Anna Fedde, on 22 March 1923 at Crete, Will, Illinois. 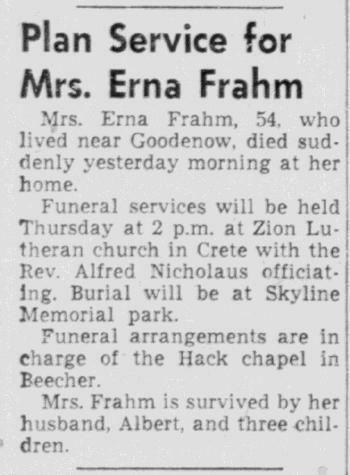 Erna Matilde Batterman died on 14 May 1956 at at home, Illinois, at age 54 Erna (Batterman) Frahm obituary. On 27 November 1947 Mina (Riechers) Batterman 82nd birthday celebration. Wesley Frahm honored after discharge from the Navy. In May 1948 at Crete, Will, Illinois, Sergeant Wayland Frahm is spending 30-day leave with his parents, Mr and Mrs Albert Frahm. In August 1952 at Harlingen, Texas, Mr and Mrs Albert Frahm and daughter Myrna Rae visited their son and daughter-in-law, Staff Sergeant and Mrs Wayland Frahm. [S244] U.S. Federal Census 1910 U.S. Federal Census, by Ancestry.com, ED143. Dwelling 29. Stamp 16. [S243] U.S. Federal Census 1920 U.S. Federal Census, by Ancestry.com, ED145. Dwelling 94. Sheet 5A. Stamp 13. [S250] U.S. Federal Census 1930 U.S. Federal Census, by Ancestry.com, ED99-83. Dwelling 127. Name Variation Heinrich Friedrich Christoph Batterman was also known as Friedrich. Name Variation Heinrich Friedrich Christoph Batterman was also known as Fred H.
Heinrich Friedrich Christoph Batterman was born on 15 January 1858 at Crete, Will, Illinois. He was baptized on 21 July 1858 at Eagle Lake St. Johns, Beecher, Will, Illinois. He married Wilhelmina Maria Riechers on 6 March 1884 at Zion UCC, Dyer, Lake, Indiana. Heinrich Friedrich Christoph Batterman died on 14 January 1916 at Crete, Will, Illinois, at age 57. He was buried on 18 January 1916 at Zion UCC Cemetery, Dyer, Lake, Indiana. [S245] U.S. Federal Census 1900 U.S. Federal Census, by Ancestry.com, ED101. Dwelling 258. Nickname Wilhelmina Maria Riechers also went by the name of Minnie. Name Variation Wilhelmina Maria Riechers was also known as Mina. Name Variation Wilhelmina Maria Riechers was also known as Minna. Married Name 6 March 1884 As of 6 March 1884,her married name was Batterman. Wilhelmina Maria Riechers was born on 27 November 1865 at Indiana. She was baptized on 13 January 1866 at Zion UCC, Dyer, Lake, Indiana. She married Heinrich Friedrich Christoph Batterman on 6 March 1884 at Zion UCC, Dyer, Lake, Indiana. Wilhelmina Maria Riechers died on 8 December 1951 at Crete, Will, Illinois, at age 86. She was buried on 11 December 1951 at Zion UCC Cemetery, Dyer, Lake, Indiana. Wilhelmina Maria Riechers had 6 with 5 living in 1900 children. On 27 November 1947 Mina (Riechers) Batterman 82nd birthday celebration. [S250] U.S. Federal Census 1930 U.S. Federal Census, by Ancestry.com, ED99-2. Dwelling 242. Sheet 9B. Name Variation Anna Margaretha Fedde was also known as Martha. Name Variation Anna Margaretha Fedde was also known as Margaret. Anna Margaretha Fedde was born on 13 January 1850 at Germany. She was the daughter of Claus Fedde and Anna Maria Moller. Anna Margaretha Fedde married Joseph Henry Fedde, son of Johann Carl Fedde and Telsche Jurgen Schuman, on 21 October 1871 at Lowell, Lake, Indiana. 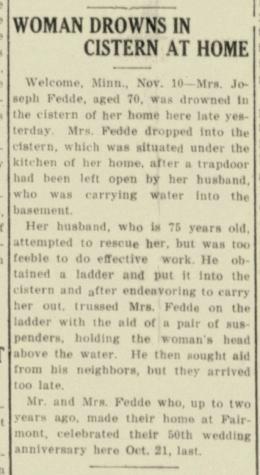 Anna Margaretha Fedde died on 9 November 1921 at Welcome, Martin, Minnesota, at age 71 Anna (Fedde) Fedde drowns in cistern at home. 7 June 1905 Fairmont Ward 1, Martin, Minnesota Anna Margaretha Fedde appeared on the census of 7 June 1905 in the household of Joseph Henry Fedde at Fairmont Ward 1, Martin, Minnesota. Photo of Joseph Henry and Anna Margaretha (Fedde) Fedde. Anna Margaretha Fedde had 8 with 5 (may be 6) living in 1910 children. She had 8 with 6 living in 1910 children. On 21 October 1921 50th wedding anniversary celebration. [S245] U.S. Federal Census 1900 U.S. Federal Census, by Ancestry.com, ED174. Dwelling 95. [S244] U.S. Federal Census 1910 U.S. Federal Census, by Ancestry.com, ED114. Dwelling 192. [S243] U.S. Federal Census 1920 U.S. Federal Census, by Ancestry.com, ED124. Dwelling 148. Claus Fedde was born on 11 November 1812 at Delve, Dithmarschen, Schleswig-Holstein, Germany, Claus was a twin with Hans. He was the son of Hans Fedde and Margaretha Catherine Dressen. Claus Fedde married Anna Maria Moller on 13 December 1845 at Blankenmoor, Schleswig-Holstein, Germany. [S236] Roger and Leslie Fedde, The Fedde's of Jewell County Kansas, page 93. Married Name Her married name was Fedde. Anna Maria Moller was born circa 1820. She married Claus Fedde, son of Hans Fedde and Margaretha Catherine Dressen, on 13 December 1845 at Blankenmoor, Schleswig-Holstein, Germany. Name Variation Hinrich Fedde was also known as Henry. He was born on 9 October 1826 at Delve, Dithmarschen, Schleswig-Holstein, Germany, Birth was also reported as Peotone, Will, Illinois. Hinrich Fedde married Anna Hecht on 30 June 1857 at Momence, Kankakee, Illinois. Hinrich Fedde died on 13 October 1889 at Peotone, Will, Illinois, at age 63. 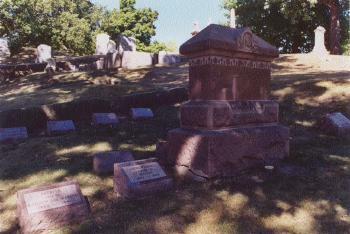 He was buried after 13 October 1889 at Peotone Cemetery, Peotone, Will, Illinois. Hinrich Fedde was a cabinet maker. On 31 May 1827 He was vaccinated 31 May 1827 by Dr. Dohn in Heide.1 He was confirmed in 1843 at Delve, Dithmarschen, Schleswig-Holstein, Germany, Birthdate was reported as 9 September 1826. [S247] U.S. Federal Census 1870 U.S. Federal Census, by Ancestry.com, Page 27. Dwelling 198. [S246] U.S. Federal Census 1880 U.S. Federal Census, by Ancestry.com, ED209. Dwelling 50. Page 6. Married Name 30 June 1857 As of 30 June 1857,her married name was Fedde. Anna Hecht was born in November 1839 at Cleve, Schloswig-Holstein, Germany. She married Hinrich Fedde, son of Hans Fedde and Margaretha Catherine Dressen, on 30 June 1857 at Momence, Kankakee, Illinois. She was buried after 24 September 1904 at Peotone Cemetery, Peotone, Will, Illinois. [S315] Illinois Death Index, by Illinois, certificate 00004512. [S245] U.S. Federal Census 1900 U.S. Federal Census, by Ancestry.com, Sheet 13B. ED141. Dwelling 236. [S203] Unknown compiler, The Hecht Herald, compiled by Kenneth Hecht Loomis, (changed name from George Kenneth Hecht) in Feb. and Aug. of 1939 and a copy is in the possession of Ronald Eugene Hecht Summers, John Frederick Hecht's great great great grandson. Name Variation Edward Hans Fedde was also known as Edward Henry. Name Variation Edward Hans Fedde was also known as Edd. Edward Hans Fedde was born on 13 February 1867 at Momence, Kankakee, Illinois. He was the son of Hinrich Fedde and Anna Hecht. He was buried after 28 September 1935 at Peotone Cemetery, Peotone, Will, Illinois. [S186] Illinois, Illinois Statewide Marriage Index, license 00013230. [S238] Illinois Death Records, by Illinois, certificate 0041193. [S245] U.S. Federal Census 1900 U.S. Federal Census, by Ancestry.com, Sheet 13B. ED141. Dwelling 235. [S244] U.S. Federal Census 1910 U.S. Federal Census, by Ancestry.com, ED191. Stamp 259. Dwelling 140. [S243] U.S. Federal Census 1920 U.S. Federal Census, by Ancestry.com, Sheet 5B. ED199. Dwelling 134. [S250] U.S. Federal Census 1930 U.S. Federal Census, by Ancestry.com, ED99-75. Dwelling 206. Sheet 7A. [S314] Illinois, Past Present Of Will County, Illinois 1907 Vol. 2, Page 478. Name Variation Elizabeth Conrad was also known as Lizzie Charlotte. Married Name 1889 As of 1889,her married name was Fedde. 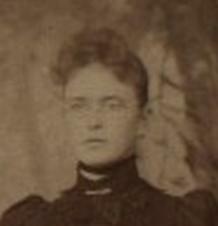 Elizabeth Conrad was born in February 1866 at Illinois. She was the daughter of Peter Conrad and Katharina (?). She was buried after 28 September 1935 at Peotone Cemetery, Peotone, Will, Illinois. [S238] Illinois Death Records, by Illinois, certificate 0041194. [S247] U.S. Federal Census 1870 U.S. Federal Census, by Ancestry.com, Page 28. Dwelling 212. [S246] U.S. Federal Census 1880 U.S. Federal Census, by Ancestry.com, NA Film Number T9-0260 Sheet 378A. Name Variation Jennie E. Barrett was also known as Jane E.
Married Name circa 1892 As of circa 1892,her married name was Croal. Jennie E. Barrett was born on 5 April 1867 at Minnesota. She was the daughter of Thomas P. Barrett and Annie (?). Jennie E. Barrett married James Matthew Croal, son of Andrew James Croal and Honora Brigid Gormanly, circa 1892. Jennie E. Barrett died on 16 August 1951 at age 84. She was buried after 16 August 1951 at Funeral, Fargo, Cass, North Dakota. [S247] U.S. Federal Census 1870 U.S. Federal Census, by Ancestry.com, Page 16. Dwelling 107. [S246] U.S. Federal Census 1880 U.S. Federal Census, by Ancestry.com, NA Film Number T9-0628 Sheet 327D. [S245] U.S. Federal Census 1900 U.S. Federal Census, by Ancestry.com, ED178. Dwelling 46. Ward 1. [S244] U.S. Federal Census 1910 U.S. Federal Census, by Ancestry.com, ED41. Dwelling 167. [S243] U.S. Federal Census 1920 U.S. Federal Census, by Ancestry.com, Sheet 20B. ED15. Dwelling 306. [S250] U.S. Federal Census 1930 U.S. Federal Census, by Ancestry.com, ED9-39. Dwelling 96. Ralph Francis Croal was born on 12 October 1893 at North Dakota. He was the son of James Matthew Croal and Jennie E. Barrett. 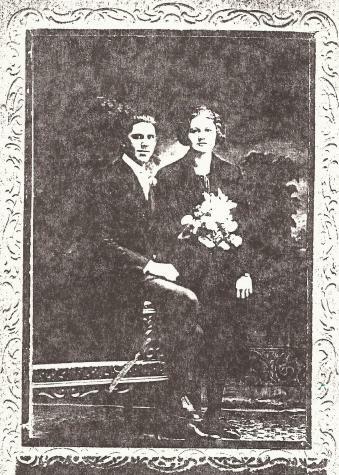 Ralph Francis Croal married Clara J. Hanson circa 1922. Ralph Francis Croal died on 22 May 1958 at age 64. He was buried after 22 May 1958 at Funeral, Fargo, Cass, North Dakota. On 5 June 1917 at World War I Draft Registration, Cass, North Dakota. In October 1940 at Cass, North Dakota, Ralph Francis Croal - State's Attorney. [S250] U.S. Federal Census 1930 U.S. Federal Census, by Ancestry.com, ED9-45. Dwelling 5. Name Variation Lewis R. Croal was also known as Louis R.
Lewis R. Croal was born on 25 April 1897 at North Dakota. Lewis R. Croal married Bernice L. Workman circa 1925. Lewis R. Croal died on 19 October 1991 at South Windsor, Hartford, Connecticut, at age 94 State File #: 22463 Industry: WILBUR & WILLIAMS PAINT MFG CO, Occupation: PAINT CHEM. Lewis R. Croal obtained US Social Security Card at Massachusetts; Last residence not specified. He and Bernice L. Workman lived in 1982 at 231 Chester St, East Hartford, Hartford, Connecticut. [S250] U.S. Federal Census 1930 U.S. Federal Census, by Ancestry.com, ED16-1474. Dwelling 134.